Wondering what exactly radial insight is all about and whether or not its another phishing scam targeted at stealing your information? In the following review, I’ll be digging deep and showing you exactly how this survey site works, what you’ll need to do to qualify for these surveys, as well as the earning potential thats available here. Radial Insight is a market research company that will pay you to answer simple questions and take surveys based on your demographics. They are based out of Arlington Virginia and they were founded in 2009. Is this survey site really worth your time or is this another one you should toss in the garbage and wash your hands of? I’ll be revealing all of this information as well as so much more so I highly encourage you to stick around and read this review in its entirety for all the juicy details. Unlike other survey sites where you’ll need to answer a series of screener questions for each survey only to find out you don’t qualify, Radial Insight eliminates all of that by asking you a few simple questions when you first sign up. As I was doing my research on this particular company, I wasn’t able to find any decent reviews out there about this company. I thought I would write a thorough review for you guys in case you had any questions about this particular survey panel and you have been wondering whether this is worthy of your time or not. This shouldn’t take up much of your time because there isn’t a whole lot to this particular survey panel so let’s get right into things. How Does Radial Insight Work? Unlike other survey sites out there that overwhelm you with a gazillion of different ways to earn money, Radial insight keeps it simple and gets straight to the point. You’ll need to register your account with them on their official site, but other than that, the interactions that you have with this site will primarily through email. Once you sign up and verify your account you’ll be able to take your first survey instantly. The surveys are pretty straightforward and to the point. The questions contained in their surveys range from multiple choice to putting things in order of importance as you see above. They usually start you out with 2 surveys back to back then you can look to receive at least 1 a week afterward. In my own personal experience and from what I was able to gather on their FB page, it’s very rare that you won’t qualify for their surveys and these usually only take 10-15 mins max for each one. How Much Can You Earn For Each Survey? Most surveys pay at least $3 each and some have the earning potential of $10 a pop depending on the complexity of the survey and how long it will take you to complete it. I was able to earn $6 in less than a half hour so there is definitely some potential to make money with this site. 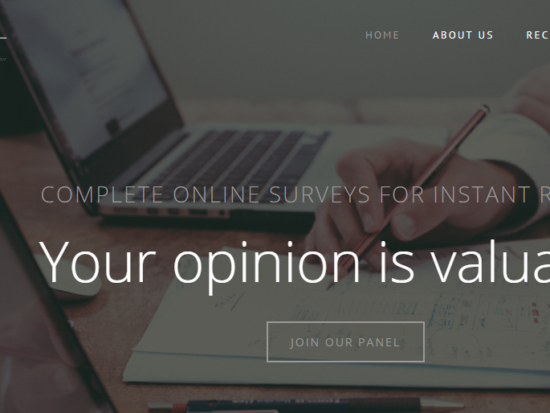 However, due to such a low volume of surveys that you’ll receive in any given week, you would need to let your earnings accumulate over time to make this worth your while and earn any substantial amount of money with this survey panel. Take a look at a few of the instant payment notifications I received shortly after completing my first 2 surveys below!! I guess if you would let these earnings build up over time you could earn a good amount for as little amount of time it takes to complete each survey. Back in July 2018, they unveiled a new and exciting program where you can get paid for submitting your online receipts to them from places like Amazon.com Walmart.com Target.com Jet.com Costco.com DollarGeneral.com. As I’m writing this updated review (Sept 2018) these are the only online retailers that are currently participating in this program right now but I’m sure as it gets more popular many others will follow suit as well. I’ll be continuously updating this review to reflect these changes so be sure to check back here from time to time. How Does Receipt Rewards Work? To participate in this new and exciting program you’ll need to install their browser extension to your web browser. This seems to work the best with Chrome & Firefox web browsers so if you’re using another browser you might want to think about switching so you can take full advantage of this. After you have added this to your browser you should see their icon displayed in the top right-hand corner of your browser. You’ll then be prompted to enter your email address to validate the add-on and activate it so you can start getting paid for receipts that you submit to them. You’ll now need to check your email and enter the 6 digit code that they sent to your email inbox. Once you have validated your account and successfully entered this 6 digit code you’ll be presented with a page similar to the one you see below. As you can see I have already started earning rewards from this newly introduced program and have earned $2.30 with it already. This is what I like to call an extra incentive that you can use to put some extra money in your pocket for purchasing products that you regularly purchase anyway, so why not get paid for it? This is a pretty ingenious idea that they have come up with and it seems like the whole receipt thing is trending right now as many people are utilizing this to their advantage. How Do You Submit Receipts? There are detailed, step by step instructions available for each of the online retailers that I’ve listed above that you can read more about here!! Instead of going through the hassle of uploading your receipts manually 1 by 1, Radial Insight simplifies this entire process by allowing you to set it up once and forget about it. Once you set up your accounts with any of the retailers listed above, their extension will automatically send all your future receipts to receipt rewards instantly. 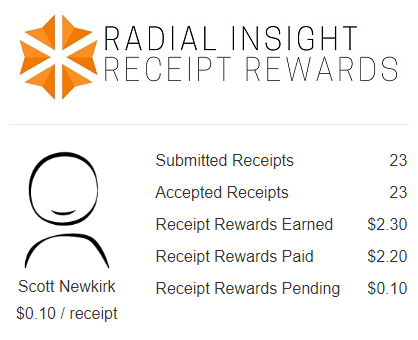 Radial Insights will send you an email everytime a new receipt has been submitted so that you can keep track of your rewards. Also, there is no limit to the number of receipts you can submit at any one time so the earning potential is pretty decent here. Especially since you’re basically being rewarded for shopping online. You’ll earn 10 cents for each receipt that you submit to them with the exception of Amazon purchases which only pays 5 cents per receipt. Once you have earned a minimum of $1.00 in receipt rewards you can cash them out to receive a Tango card. What Does Radial Insight Do With This Information? As a market research company, they simply use your receipts to study your purchasing habits online so they can better gauge the way that retailers market their products to you. Many huge big-name companies hire market research companies like this one to learn more about their customers so they can market their products and services to them more effectively. By studying your shopping habits and the things you purchase online they can fine-tune their marketing strategies and techniques to generate more sales and bring more revenue to their business. They also use your information to learn more about current retail trends that are happening right now. It’s important for you guys to remember that this applies to only your purchases made online as this program doesn’t support receipts from retail stores at this current time. Your personal information is 100% secure and you don’t need to worry about them selling your private information with third party companies. Radial insight has teamed up with another company called the Tango Card. Shortly after you complete your survey you’ll be notified by email with how much you have earned and instructions on how to claim your reward. Your earnings will be deposited on a Tango Card and like you have seen in the screenshot above you’ll be provided with a card number as well as a pin number. You can redeem these cards and choose your reward on the tango card website. Take a look below at the wide selection of gifts cards that you can choose from when cashing out your reward. There is no payment threshold required to cash out your earning and these usually appear in your inbox within a couple of minutes. They will send these to the email address on file so make sure that the email address you used to register your account is valid or you won’t get paid. If you’re feeling generous and you would rather donate your earnings to a nonprofit organization you can do that as well. Is Radial Insight Really Worth Your Time? To be quite honest with everyone here today, I found this particular survey panel to be one of the better ones out there that actually pay. I was quite impressed that I was able to earn $6 in under a half hour by answering a few quick surveys. I can remember spending up to an hour on other survey sites only to be told that I didn’t qualify and I earned zilch, zip, zero. Due to the fact that this company only sends surveys out once a week, you may find this pretty challenging to make any decent amount of money with this site. However, if you combine this with other similar sites like Swagbucks, Paidviewpoint, and Survey Junkie and this could be worth your time. Keep in mind that the earning potential with any survey panel is really low and it’s not possible for you to earn a living from simply taking surveys. Also, many survey panels like this one don’t offer cash payments, only gift cards. So, if gift cards aren’t your thing then I don’t think this site would be a good fit for you. If you would rather not waste your time taking surveys for gift cards and you would be interested in learning how to build your own business based on something you’re passionate about, I would highly suggest that you check out a company called Wealthy Affiliate. This is where I got my start in the online world and this is where I learned how to build an online passion based business doing something I love. If you have ever had any kind of interest in building websites or making money online, I would highly recommend that you check them out and see what they can do for you. With their Free Starter Membership package, what do you have to lose? Other than that, I really hope this review has given you guys a closer look inside this survey panel and hopefully I have provided you with all the necessary details needed for you to make a sound decision as to whether you could benefit from this site or not. Do you have a personal experience that you would like to share with other people regarding this company? I would love to hear all about it in the comments below as well as answer any lingering questions that you may still have. hello such scott greetings, hey I would like to know how to register since I can not do it, although a friend can do it, some data or tip at the time of registration in terms of physical address and another question is if every time I register Will you ask me for a phone number to verify? Why can’t you register for an account? Are you getting some type of error msg when signing up for an account? What issues are you having when signing up? Maybe I can help you out with it. Yes, you will need to provide a valid phone number each time you register, but if done correctly you should only need to register 1 time and thats it. No, if you were referred by someone else then you wouldn’t need to verify your number again, just the initial time when you originally signed up. I hope this clears up any confusion that you may have had with this survey panel and answered your questions in detail. I have received no issues with Radical Insight in the past and collected my earnings on time. Since Radical has the new browserbucks.exe file, I have been unable to download the files to take surveys on my phone and or computer. Can you troubleshoot and resend the link to my email address please. Thanks. I’m glad to hear about your positive experience with Radial Insight. However, I’m quite confused about this browserbucks.exe file that you’re talking about. There are no files to download in order to take surveys on your phone or computer. They send you an email informing you of the available surveys and this is usually based on a first come first serve basis meaning that these spots usually fill up quite fast. I don’t work for them or nothing so I can’t resend the links. She should be able to help you out more and clear up any issues you may have. I hope this helps Debbie and thanks for stopping by and sharing your experience with everyone here today. I came across you review when I was looking for info about Radial Insight. I appreciate you taking time to not only post your experience with them and other sites, but I’m impressed that you reply to people who have questions/problems. Class act there. I am writing to suggest another site. It’s called American Trends Panel. I’ll be honest and say that they contacted me and invited me to sign up because I subscribe (for free) to Pew Research Center for a couple of their regular email reports about subject areas/topics that interest me. They asked me to complete an intial survey that included collecting some demographic info. I get a survey by email once a month (yes, just once a month). They send me a check for $5.00 for each survey but I was offered some alternatve payment forms. I don’t recall the options but I was reluctant to put my banking info out there. So getting a check works for me. I was willing to do it because Pew Research is one of the most respected survey organizations in the world. I ‘ve see them cited for all kinds of serious research over a broad variety of topics all my life (let’s just say I’m a retired liberal). I don’t always agree with their results, but I respect their work because they are not about taking any kind of political, racial, religious, gender sides. They just ask questions and give the results. They let other people interprt the results and the meaning of the results for themselves. They will conduct surveys for whoever is paying without asking questions the payer says to ask. They don’t do “push” surveys or other such questioning that trys to get a result the payer is looking for. That’s why they are so widely respected. Now no one is getting rich on five bucks a month. Then again no IRS hassels either. If someone wants to participate, I’d say Google eithe Pew Reasearch or American Trends Panel and see for themselves. By the way, the surveys take only about 15 minutes and I think they are interesting. Sometimes I even learn something about myself. It comes to mind that I might still have a link and phone # for American Trends. I’ll look for that info and get it to you if you like. Hello there Richard and thank you so much for dropping by my site!! You are most welcome Richard and I feel like it’s highly important to share my personal experience that I’ve had with other online opportunities, survey panels, and programs that I’ve personally tried out and I know works. I also love to help other people out and answer any questions they may have and try to resolve any issues they have with these programs to the best of my ability. It sounds like American Trends Panel is another site that is worth checking out and doing a review on and I will definitely have to put this on my list of programs to review in the near future. $5.00 a month isn’t much, but hey every little bit counts and I’m always looking for additional ways to add a few income streams and it sounds like this is a pretty respectable program that my readers could benefit from. If you could pass along a link or phone # that would be great, I would really like to check them out. I really wanna thank you for stopping by Richard and sharing this info with me. I love what you are doing here-glad I stumbled upon your site. I tried to sign up for the Radial Insight. It says I am not eligible. I say SCAM all the way. Their Twitter account hasn’t been used since 2016. SCAM. I can probably find more, that is all I found in 5 minutes. Hi Macky and thanks for dropping by today. Let me get this straight, you’re going to call something a scam based on you not being eligible to sign up and because they haven’t used their twitter account in a year? Let’s not forget that it’s free to sign up and they actually do pay you $3 for taking a survey that takes 10-15 mins max. I have got paid multiple times from them and have cashed out my earning for real gift cards to places like Best Buy, GameStop, Amazon, and many others. I could keep going as well but I’ll stop right now. I was trying 2 register with radial insight. but it keeping showing invalid email address and my email address is working perfectly.any solution? If it keeps showing invalid email, then you should send their support team an email informing them of your situation and they should be able to help you out. If not, you might want to try registering with a different email and see if that helps or not. I hope you’re able to get this issue resolved and hopefully sign up for your free account. My name is Ray Davenport and I have been trying to reach Radial Insight for some time but there is never a reply. My email address was raydavenport20@yahoo.com but they ask me to change my password and then there system would n’t take my new password . So now I use raydavenport71@Gmail.com (Gmail with a small g) I have $19.00 under my old small address and I would like it to be put under my new email address. When I say they, I mean Yahoo. It sounds like you have 2 separate issues going on here and I’ll help you with them as much as I can. First off, why are you contacting Radial Insight in the first place? Are you having issues with your RI account or are you contacting them because of your password issue with Yahoo? I have heard other people say that they couldn’t get a response out of them either. This is weird as I have contacted them several times and I even spoke with Emma who is one of the support staff members and she answered me within a reasonable amount of time. If you’re contacting them to have your earnings transferred from your old account over to your new account then I think you could solve this issue by recovering your old Yahoo email address. Try to reset your password once again and if you still have trouble with this then contact Yahoo support and they will help you recover your email account. Once you have recovered your account you should be able to login to your old RI account and retrieve your $19 from this account. I really hope this helps you out Ray and please let me know if you have any other questions or need my help. received a reply. I did so last night after not receiving my reward. I also called and left messages to no avai. So right now I am not in a good place with this company. What should I do? Thanks Scott for letting me vent. I’m sorry to hear that you’re having trouble getting paid for the surveys you’ve taken with Radial Insight. That’s kinda crazy that you’ve emailed them several times and they haven’t responded to you or sent you any kind of correspondence. So you have continued taking their surveys for nearly a year now without getting paid? If I hadn’t got paid in almost a year or heard anything from them I would have quit taking them a long time ago. I just took a 10 min survey from them last night and within minutes my $3.00 Tango gift card was sitting in my inbox waiting for me the claim my prize. Here recently they just launched their Radial Insight Panelist Portal where you can register your account, log in and check out everything they have to offer. You can also check out your survey history and keep track of all the surveys you’ve taken in the past. Have you registered your account within their new panelist portal? If not, then I would do this and try reaching out to them one last time. I actually contacted their support team last night and they answered me within minutes. You might wanna try and contact Emma which is their project manager and see if she can be of any assistance to you. I hope this helps Debbie and please let me know how this works out for you and if you have any further questions. I would give it 1 more shot before totaling abandoning them and cutting your losses altogether. You definitely don’t wanna feel like a stalker and if you have emailed them that many times perhaps it’s time for you to move on and pursue other options to make money. Have you considered any other survey sites as a way to earn extra money on the side? If you’re looking for an alternative to Radial Insight then you should look into Survey Junkie or Paidviewpoint. I have made a decent amount of money with these survey sites as well and would recommend them as a viable alternative. I hope you’re able to get somewhere with Radial Insight and please let me know how this works out for you. I give up. I am crying on the inside now. I loved this site. Thank you for an extremely well done review. I just saw an ad for Radial Insight and after reading what their website said went to Google to look for reviews before deciding whether to sign up as I have gotten tired of sites like Swagbucks making me put a lot of time into surveys only to tell me time and time again that I don’t qualify. Based on your review, I am willing to take a chance on Radial. You are very welcome Doreen!! There are some negative reviews out there from people who had a bad experience with this company. Radial Insight isn’t perfect by any means and they have their flaws like anything else. However, I found the surveys here to be short, fun, and interesting compared to other survey panels out there. As a matter of fact, I just made $3 a couple of hours ago for a survey from here that took me less than 10 minutes to complete. The payment was instant and delivered to my email inbox within minutes. You don’t get paid cash but you can earn some pretty awesome free gift cards for only 10-15 min of your time. This is definitely 1 of the better sites out there that actually pays you for your opinions with no payment thresholds or waiting periods. There were no screener questions and you never get disqualified half way through the survey like other survey panels out there. Definitely, check it out for yourself and come back here and share your experience with everyone else. I’m glad this review has helped you out and thank you so much for stopping by and letting me know how much it has helped you. 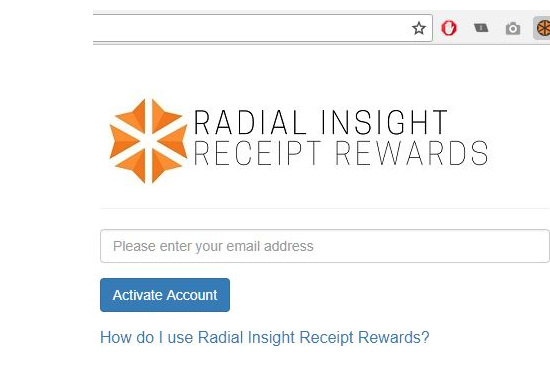 Thanks for the info on Radial Insight..my question is how does taking surveys for gift cards or cash work with IRS? Is this reported as income to them by these online survey companies? Is a person liable to report income and or pay taxes? You are very welcome Charles!! Since you’re getting paid with gift cards there is no need to worry about reporting this to the IRS. You only need to report your earnings to the IRS if you earn over $600 in a calendar year. Due to the fact that Radial Insight only offers a gift card option, and no cash you wouldn’t need to worry about this with this particular opportunity. I hope this helps answer your question Charles and please let me know if you have any other questions or need my help. My question is, have you had any trouble cashing out and getting your Tango card?? I have read reviews for other survey sites that people have to wait “forever” to get their gift cards or “after multiple e-mails to customer support I finally got mine”. I went on the Tango website and found out you don’t actually need the physical retail card to use it in-store so I will not ask how do I buy items without a physical gift card. Surprisingly enough, no I didn’t have a bit of trouble cashing out and receiving my gift card. It was a really smooth process and took me less than 5 minutes to receive my gift card code in my email inbox. All I did was pick the gift card I wanted and went through the checkout process. Like you, I have read many other reviews and even experienced it myself where I would have to wait weeks and send multiple emails just to get paid. Once you receive your gift card code, you can redeem it either online or in the actual store and there are detailed instructions on how to do this in the email you’ll receive from them. I hope this helps answer your question and if you have any other questions please let me know Paul. I also want to thank you for stopping by and chiming in on this review man, I really appreciate it. You’re welcome. I discovered your site while searching for review sites. What I love about your site is you actually tried each site firsthand and gave your honest opinion so others don’t have to learn the hard way. I really appreciate that. Thank You. I’m glad that you were able to find my site and I’m glad that I was able to act as your personal tour guide and share my first hand experience with you. I try to actually try out everything before I review it so I can write an honest and unbias review of the product so that other people like you don’t have to learn the hard way. Thank you so much for the kind words about my site and I’m glad that I was able to provide you with the information you were looking for. You are very welcome Paul and once again I want to thank you for stopping by. Thank you so much for doing this! I am disabled and have been filling out surveys for years. I have really come to resent the ones who make only empty promises. By any chance, do you have a more comprehensive “list” of the companies that are worth joining & spending time vs. the ones that are not? If so, I’d love to compare notes. You are most welcome David!! Like you, I have also been filling out surveys for years and 95% of them ended up being either a waste of time or more of a headache than they were worth. There are very few survey sites that I mess with anymore, but I have found that there are still a few reliable ones and I’ll list these for you below. These are the most legit sites and the only ones that I would honestly recommend to you. I hope this helps you out David and please let me know if you have any other questions. Thank you so much for stopping by and chiming in on this review David. Thank You Scott on your review of Radial insight. I was skeptical at first but after reading what you wrote it truly put me at ease. You covered so much information that I went ahead and signed on. Already did my two surveys so guess now I wait for payment or another survey! No problem at all Marilyn!! It’s natural for all of us to be skeptical at times and to put our guard up when contemplating whether we should join another survey panel or not. While I don’t feel like this is the best survey panel out there based on the reasons I’ve uncovered in my review above, it’s definitely an easy way to earn some gift cards for only a few minutes of your time. It’s great to hear that my review has put your mind at ease and that you were able to complete your first 2 surveys. You can either let your earnings add up or go ahead and cash them out for the gift card of your choice. Thank you so much for stopping by today and sharing your experience that you’ve had with this survey panel with everyone here today.